Vickers used a three or four digit number to distinguish between the different subtypes of a design. For the VC10 these started with type 1100 which was the prototype. 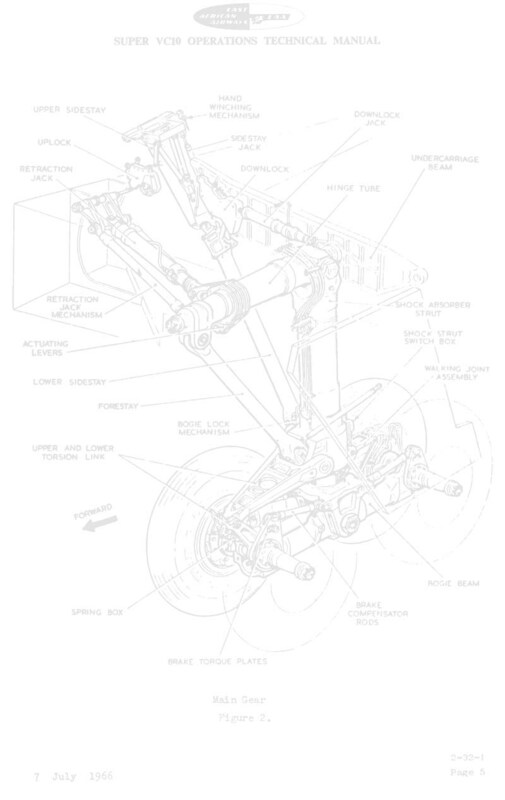 As originally built all Standard VC10s had type designations starting with 110x, and all Super VC10s started with 115x. Vickers held on to this in all their proposed variants but when the RAF Tankers were produced that convention was dropped. Eventually the type 1106 RAF C Mk. 1s received a type designation 1180 after their tanker conversion, a designation that was originally planned for the double deck VC10. All the designations below in italics were not built, the ones in bold face did fly (with some still soldiering on). 1101 BOAC production version, twelve built. 1102 Two built for Ghana Airways, one with main deck cargo door, both with 4% wing chord extension. 1103 Three built for BUA with main deck cargo door and wing chord extension. 1104 Nigeria Airways version, none built. 1105 Original designation for the RAF version, this was changed when the RAF decided to incorporate the main deck freight door. 1106 Fourteen built for RAF transport command as VC10 C Mk 1. Modifications included folding hatracks, machined cargo floor, Conway Rco.43 engines and fin fuel tank. 1107 RAF tanker, none built. 1109 Prototype converted to airline standard for Laker airways, with type 1106 wing. 1110 Generic designation for VC10A. None built. Vickers later used this as an internal designation for the Sultan of Oman's VC10. 1111 Version of VC10A for BOAC. Not built. 1112 VC10 K Mk 2, tanker conversion for RAF of type 1101, five converted. 1125 Standard (could be a hybrid Standard/Super design) VC10 for Aerolineas Argentinas, none built. 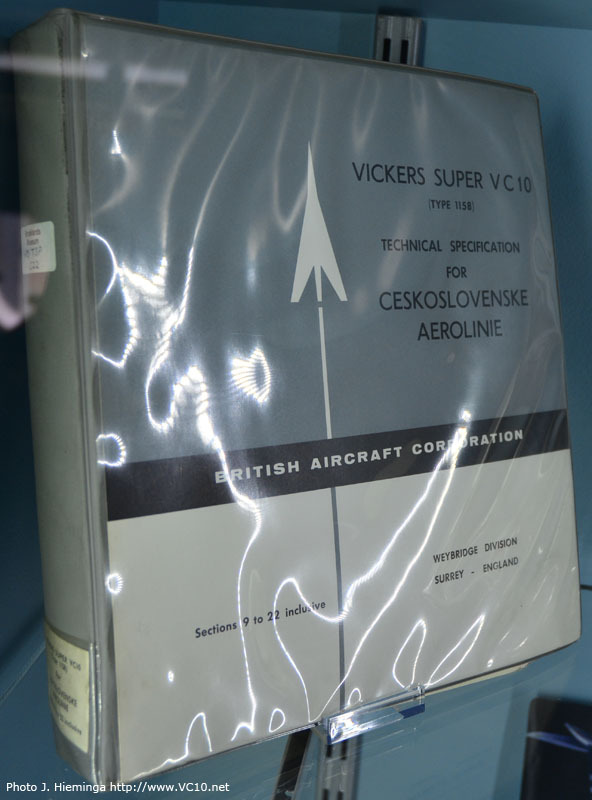 The specification for the Type 1158, Super VC10s for Czechoslovakia. 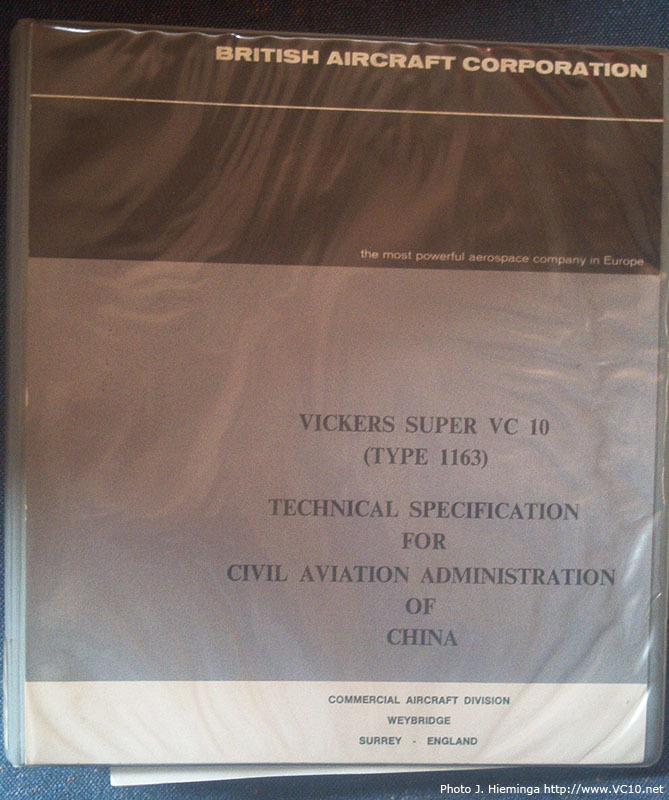 Cover of the specification for the Type 1163, Super VC10s for China. Another unbuilt variant: A Super VC10 version for BUA. 1151 BOAC production version of the Super VC10, included in the super were: wing chord extension, Conway Rco.43 engines and fin fuel tank, seventeen built. 1152 BOAC Super VC10 version with main deck freight door, none built. 1153 Not built. Some sources claim that this variant was designed for EAA but this was not the case. 1154 Five Super VC10’s built for East African Airways with main deck freight door. 1157 Super VC10 for Varanair Siam, none built. 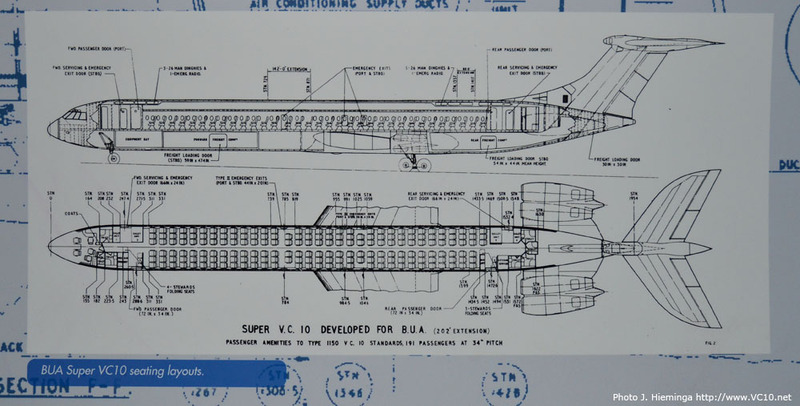 1158 Super VC10 for CSA, none built. 1161 Super VC10 for Nigeria Airways, none built. 1162 Super VC10 for Tarom, none built. 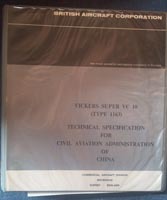 1163 Allocated to a specification for Super VC10s for China. Specification shows both full passenger and combined passenger/freight layouts so this version would have had a main deck freight door, none built. 1164 Super VC10 K Mk 3, tanker conversion for RAF of type 1154, four converted. 1166 Proposed conversion to RAF tanker VC10K Mk.3A, none built. 1170 Super VC10 K Mk 4, tanker conversion for RAF of type 1151, five converted. 1180 VC10 C Mk 1 K, tanker conversion for RAF of type 1106, thirteen converted. 1191 Proposed short haul version for BEA, none built. G-AXLR Delivered as a type 1106 to the RAF this aircraft was leased to Rolls Royce for airborne testing of the RB211 Turbofan engine. To accomplish this the no. 1 and 2 engines were removed and the pylon was modified to accept the larger RB211 engine, thereby creating a three-engined VC10. After flying for Rolls Royce for five years the aircraft was flown to RAF Kemble, Glos, but never returned to squadron service as it was found that the airframe was distorted. It was struck off charge and robbed for spares, and for several years thereafter served as a training aid for Special Air Service special forces troops.